The Structure module allows the integration of structural mechanics into the SIMDRIVE3D environment. It enables the powerful functionality of combining stresses with real time results of the MBS-Simulation in order to determine the coefficient of safety and the weakest point in the structure. 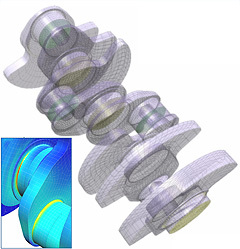 The parametric web and geometry optimization delivers a vastly enhanced development process. With the possibility of creating BEM meshes, it features a swift calculation of inertia tensors of various elements. By linking the BEM Structure to a MBS model, the dynamic stress behavior can be determined with different calculation approaches. 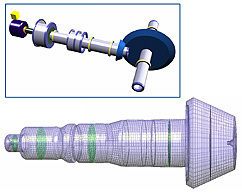 The Parametric Crankshaft is the basis for a structured approach in crankshaft web design, enabling a simple variation of a specific design element, such as fillets, base or pin diameters, shoulder or counterweight specifications. The combination with a powerful MBS-Simulation and a highly advanced stress analysis under realistic load condition simplifies the DOE-Process. The BEM Rotary Connector is applicable for the setup of shafts used in transmission or drive line and torsional vibration dampers. The automation of the transformation into an MBS-Model enables a faultless setup of an accurate simulation model. 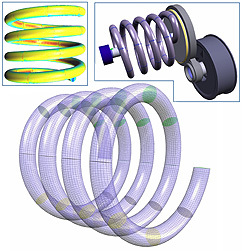 The BEM Spring depicts a highly accurate approach to create a structural model of a spring: Starting with an automated process to create a MBS-Model, using the displacement of a time domain simulation for the calculation of stress within the spring to predict the life cycle.